At this point, a Cleveland Cavaliers season isn’t complete without a month’s worth of trade rumors surrounding Kevin Love. The next trade deadline which doesn’t feature sourced stories about his impending departure from the Cavs will be the first in three years. Ever since Love came to Cleveland, he’s been the media’s odd man out, finding himself in the middle of reports claiming his not fitting in may result his being dealt. Things are no different now, as the popular click-bait these days revolves around a potential Love-for-Carmelo Anthony swap with the New York Knicks. What’s surprising about this year’s round of trade rumors is the fact it’s astounding how little sense they make. This is especially true since Love is in the middle of his best season as a Cavalier. I’ve vented enough about this in the past, but when you have a night like last night, where an outstanding performance from Love against the Washington Wizards runs parallel with off-court rumors about LeBron James trying to shove him out the door for Anthony, it’s hard not to feel a mix of frustration and sympathy. It forces you to wonder what Cleveland’s stretch forward has to do to finally convince people he’s not expendable. For those who missed it, the latest edition of “Love is Trade Bait” was released last night by Frank Isola of the New York Daily News. It centered, of course, around the Anthony rumors. However, there was an added twist this time around. Per Isola’s source, James was insisting the team’s front office trade for Anthony, even if it meant dealing Love. Said report was denied locally at breakneck speed, and was later referred to as “trash” by James. Everyone with the Cavs, including Love himself, claimed he wasn’t going anywhere. 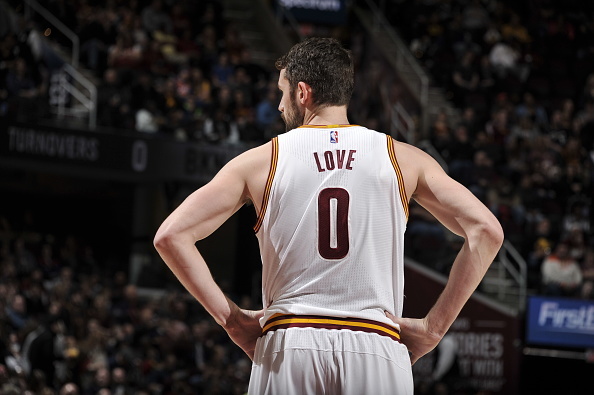 What’s more surprising, though, is the fact Love is still the lone man in Cleveland’s trade rumors. Despite everything that’s taken place since his first rocky year with the Cavs, it hasn’t stopped him from having to answer questions about being dealt. Again, we’re in the middle of a season where Love is finally looking like the third member of Cleveland’s Big Three. He’s averaging over 20 PPG for the first time as a Cavalier. Love is the only player in the entire Eastern Conference averaging at least 20 points and ten rebounds per game. As a result, he’s heading to his first All-Star game since coming to Cleveland. Let’s wrap it all up with the fact in his past two games, when these rumors started ramping up again, Love contributed a combined 62 points and 28 rebounds. How can you hear all of this, for the third year in a row, and not feel some sympathy for Love? Critics are still waiting until the moment he shows the slightest flaws to pile on and claim he needs to be traded. When the Cavs won Game 3 of last year’s Finals, it was because Love was out with an injury. If Cleveland hits a slump, maybe trading Love will fix it. The team displays the slightest bit of adversity, a hairline fracture in the armor, and all the sudden it’s time to think about moving Love. To be fair, his first two seasons in Cleveland seemed to provide a little more reasoning for the rumors. His struggles to fit in were blatantly obvious in year one and less so, but still present in year two. Now, though, in the midst of an All-Star season, the fact Love is still having to respond to the latest trade rumors surrounding him is astounding. Even more so is the fact there are those who believe Anthony would be an upgrade over him, that a one-for-one deal with those two would make Cleveland better. Such a belief is false. This is thanks in part to Love finally becoming the player the Cavs hoped he’d be when trading for him in the summer of 2014. Despite this, hearing about his potential trade is now an annual tradition, and you have to wonder if there’s anything Love can do to bring this trend to an end. My guess is no. As a result, we might as well prepare for more rumors of his departure in 2018.